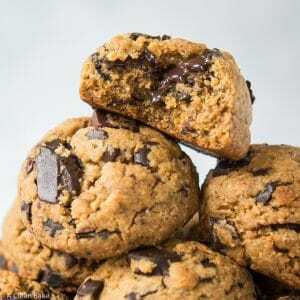 These paleo & vegan chocolate chip cookies are so rich, decadent and ooey gooey, you’ll never know they’re better for you! 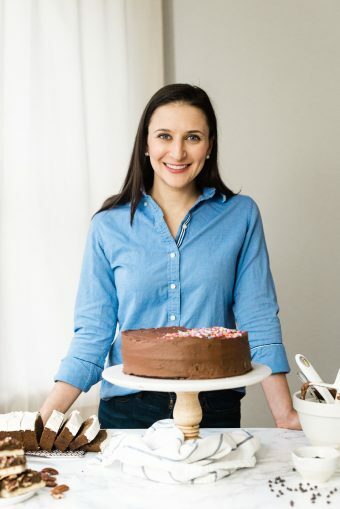 They’re free from dairy, eggs, butter, grains, and gluten and better still, they come together quickly with just a couple of mixing bowls and a spoon. Whip up a batch today! Well, I think it’s safe to officially declare this a cookie spree. Maybe not from where you’re sitting (since I’ve only posted this and one other so far) but I can assure you that my carefully curated editorial calendar has been wiped clean because all I want to make is cookies. Ok, that’s a lie – the part about the editorial calendar, anyway. But the sudden urge to bake all the cookies in the known universe stands. 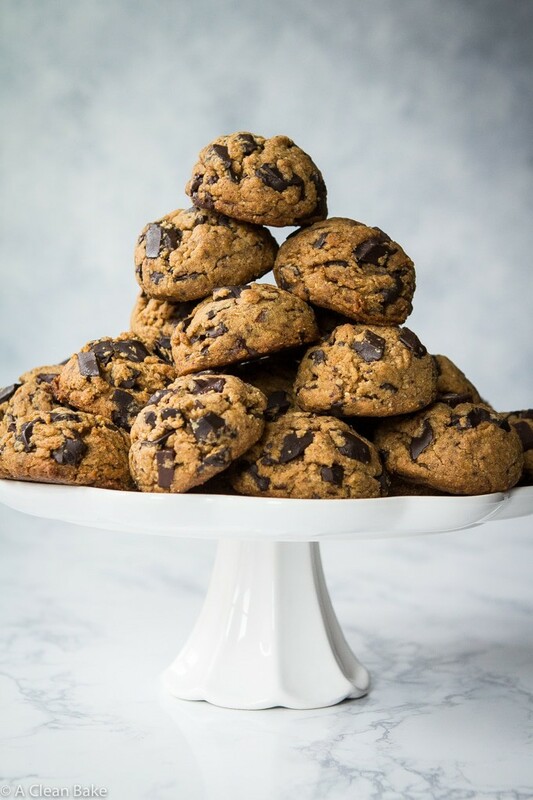 These paleo & vegan chocolate chip cookies are a hop, skip and a jump from the incredibly addictive edible cookie dough that I posted last year, and why not? If the dough is that satisfying, why not take it just one step further and actually bake it into an ooey-gooey pile of soul-satisfyingly rich chocolatey goodness? While that sentence sounds like a load of delirious nonsense, you get the point. And if you don’t, you definitely will as soon as you taste these cookies! 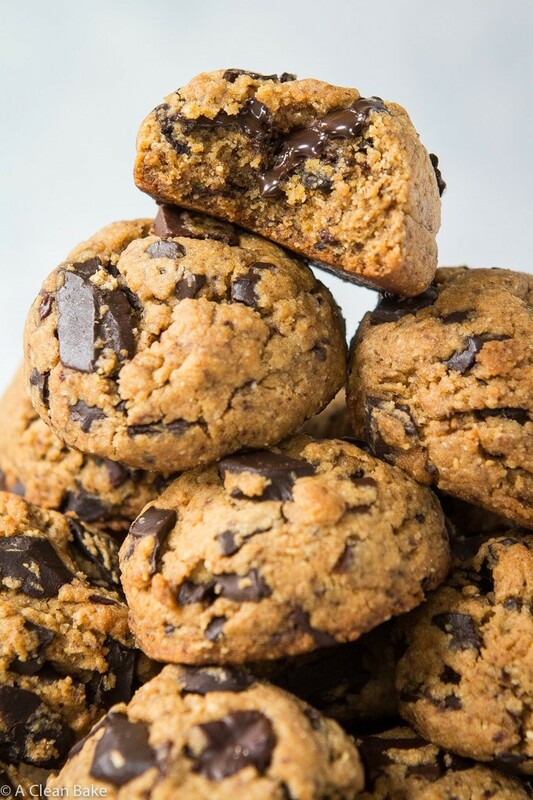 These paleo & vegan chocolate chip cookies are so rich, decadent and ooey gooey, you'll never know they're better for you! They're free from dairy, eggs, butter, grains, and gluten and better still, they come together quickly with just a couple of mixing bowls and a spoon. Whip up a batch today! Preheat the oven to 350F. Cover a baking sheet with parchment or a nonstick pad and set aside. In a small bowl or ramekin, combine the flax meal and water. Stir to combine and set aside for 5 minutes to thicken. In a medium mixing bowl, whisk together the coconut flour, sweetener, baking soda, and salt. Set aside. In a large mixing bowl, stir together the almond butter, maple syrup, coconut oil and vanilla until combined. Add the dry (coconut flour, etc) mixture to the wet (almond butter, etc) mixture and stir until well incorporated. Then add the flax egg which should have thickened into a gel by now and stir until the batter thickens and turns to a cookie dough-like consistency. Scoop 2.5 Tablespoon portions of dough and roll into a ball. Flatten each one slightly (optional) and place on the prepared baking sheet, about 1-2" apart. Bake for 15-20 minutes until the cookies start to loose their sheen. If you'd prefer to use coconut sugar instead of stevia or monk fruit, use 6 Tablespoons of coconut sugar in place of the 1/4 cup of stevia. 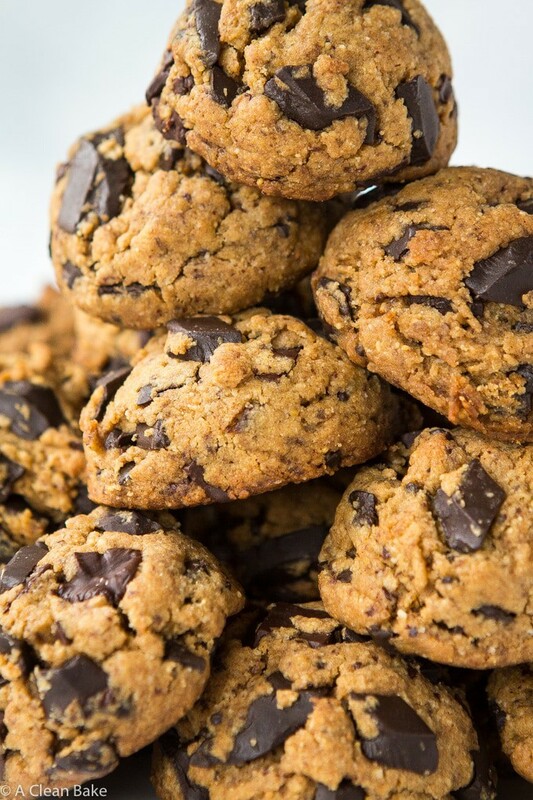 Cookies made with coconut sugar with spread slightly less than cookies made with stevia or monk fruit. Make sure you are using an almond butter than is unsweetened, unsalted, and not a no-stir kind. You do want the kind where the oil separates slightly and rises to the top. It is best to stir as much of the oil back in and, if possible, for this recipe, use almond butter from the top half of the jar. You can use the bottom half of the jar but expect the cookies not to spread in the oven. You can replace the almond butter with any other nut butter, or peanut butter, but do not use sunflower butter. The baking soda reacts to a chemical in sunflowers and turns the cookies green! Before you mix the flax egg into the batter, the batter will seem runny - too runny. Don't worry. Add the egg and keep stirring until the batter turns to a slightly sticky cookie dough consistency. These cookies will be soft and will not hold together right out of the oven, so do not attempt to transfer them to a cooling rack right away. They firm up considerably as they cool. These look incredible- pinning to make ASAP!